info Created with Sketch. plus Created with Sketch. series Four Seasons (2006), which was displayed in the exhibition Give a damn. Can you talk about the story behind creating Four Seasons? I created Four Seasons in 2006 when I was a graduate student at UCLA. I was feeling homesick for my community, so I went to the Natural History Museum of Los Angeles County because I knew that I would be able to find Crow objects there. And I know that sounds messed up, and it is messed up, but I knew the one place that I could find anything of my community would be in the Natural History Museum. The way that the building was set up, you walked under this big brontosaurus and saw all this extinction, and then you entered the Native galleries. It set people up to think of Native people as extinct. I’ve always loved dioramas, but it was uncanny how much the museum’s dioramas looked like Montana, where I’m from, but there was this sense that everything was dead here. I wanted to re-create that scene in a way where I could grapple with those feelings but also encourage viewers to step back and really think about what they’re seeing. Describe the dress you wear and your hairstyle in these photographs. In Four Seasons, I am dressed exactly how my grandmother dressed me and how I was raised to present myself as a Crow woman. The hairstyle that I am wearing, that all Crow women wear, is to part your hair down the middle and then braid your hair over your ears. The dress is an elk-tooth dress or iichíilihtawaleiittaashte. The elk-tooth dress is really important to Crow women. It’s a status symbol. What we’re saying by wearing the eye-teeth of an elk—there’s only two per elk—is that we have really good hunters in our family. We’re showing off the men’s ability to hunt or to trade. Or, if you’re from a well- respected family or you’re an older woman, elk teeth may be gifted to you. During the reservation period, Crows were no longer allowed to hunt and elk were becoming extinct, so Crows started to carve the teeth out of wood or bone. Now they’re made out of resin, plastic, or sometimes glass, but they still hold that same status symbol. You’ve created these highly artificial dioramas with inflatable elk and Styrofoam snowballs, but you’re wearing your actual Crow dress. Can you talk about your use of artificiality and authenticity? I grew up on the Crow Indian reservation, and a few years ago, it dawned on me that my family and my community is really poor. I had never associated us with poverty, but a lot of my aunts and uncles never went to college, and they’re on welfare; if you drive through our reservation you’ll see rundown houses. I think the biggest reason I didn’t think of us as poor is that we’re so culturally rich. I feel like we’re the richest people because we have our culture. Every third week in August, we have an event called Crow Fair that’s been happening since 1904. This year is the 100th Crow Fair. And you’ll see us all don our finest regalia, parade on our horses, and set up camp. It’s known as the “teepee capital of the world,” and it’s just the most beautiful thing, and it’s full of power. For me, the elk-tooth dress embodies that cultural richness and that power. I feel like humans crave nature and beauty. In urban areas we have parks so you can get away and be in fake nature. In Four Seasons, I used fake nature to pull people in. That’s where people really grapple with the piece. They see that everything else is fake, but this outfit that this woman is wearing looks and feels very real. You don’t see this outfit in Hollywood or Disney movies; the Indian princesses are not wearing elk-tooth dresses. So people realize, wait a minute, there’s something that is different here that I can’t just disregard. That’s what creates the tension in the work, when people recognize that there is something very real about this person in this fake nature. Do you want to see Native culture removed from natural history museums? It’s important to acknowledge the institution and the history of the institution. I’m not someone who says that things should be taken out or erased, but I want Native people to have their voices and opinions inserted in those institutions. It’s a puzzle, and the museum is missing these other pieces of the puzzle by not including Native voices. When I walked into the Natural History Museum more than a decade ago, I realized there was no Native voice in this institution. Everyone walking into the institution was set up to take things at face value. Our community is so small that if I would have known the name of the original owner of the Crow moccasins that I saw there, I could have known that I was directly related to them or went to high school with one of their descendants. I never want to forget history or places, even if they’re bad. I want to build off of what’s there. What do you think about Edward Curtis and other photographers who were setting up things for their own particular messaging and using photography as a way to present an idea of the “true Indian”? Edward Curtis’s body of work is so important. I’m really happy that he did it even if the circumstances were of the time that he was living in. Without that work, we would be missing a large chunk of the puzzle. He went to my reservation in the early 1900s, and he took a bunch of photographs of my community. And I’m really happy he did that because I want those photographs. I want to see my community. And the beauty of it is that I can now use those photographs and put in other parts of the puzzle that are missing. 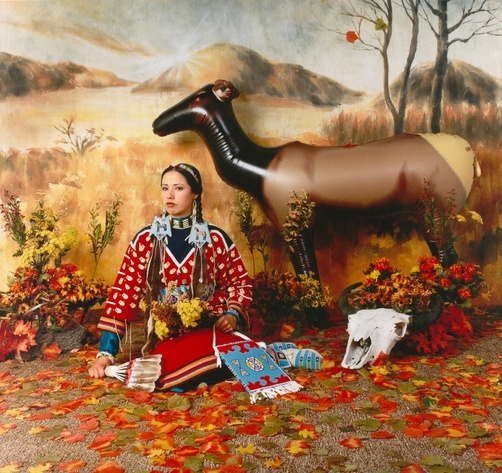 How do you feel about contemporary non-Native people putting on Native dresses and setting up situations for photographs? There are camps in Russia and Germany where they dress up as Native people. There are pictures of this woman from Russia dressed in a Hot Dance outfit, which is a Crow man’s outfit. And I was astonished because she did a really good job. How did she get a Hot Dance outfit all the way over in Russia? It’s sort of obscure. I see that, and I want to talk about it. Can I meet this woman? There’s something to be said, there’s sort of her unknowing of things but her also picking up things. Even that is part of the puzzle of how Native people are viewed and how our stuff is used. So is there any type of use that you would label a misuse or that isn’t okay? I’d like to get down to the bottom of her wearing that outfit for sure. There’s this whole idea that Native people or Indians or whatever are one homogeneous thing, and we’re not. Wendy Red Star is a multimedia artist who was raised on the Apsáalooke (Crow) reservation in Montana and currently lives and works in Portland, Oregon. Her work explores intersections of Native American ideologies and colonialist structures, both historically and in contemporary society. She holds a BFA from Montana State University, Bozeman, and an MFA in sculpture from the University of California, Los Angeles. She is the recipient of an Emerging Artist Grant from the Joan Mitchell Foundation. Originally published in Accelerate: Access & Inclusion at The Tang Teaching Museum 2 (2018). “Wendy Redstar on Dioramas and Representations of Native Culture.” Interview by Ian Berry and Rebecca McNamara. Tang Teaching Museum collections website. (https://tang.skidmore.edu/collection/explore/56-wendy-red-star).